On country roads drivers often become impatient when behind trucks but you should not take unnecessary risks when overtaking. Always assess the risks. Some trucks need extra space at corners, intersections and roundabouts. If they are over 7.5 metres long they have 'DO NOT OVERTAKE TURNING VEHICLE' signs and may need multiple lanes to make their turn. So keep a safe distance away and give them enough room to move. The DO NOT OVERTAKE TURNING VEHICLE SIGN fitted to the rear of trucks and trailers allows the truck to legally turn from the second or third lane from the kerb if needed to safely get around the corner. Always be careful when passing a turning truck that has these signs. Watch for truck indicators. If you are on the truck's left - which is one of the driver's blind spots - it may need to turn left across your path, without the driver being aware that you are there. In the example shown right, when the truck pulls into the right lane but has its left indicators on, do not pull up the inside left lane, as the truck will turn across your path. At smaller roundabouts a truck may require both lanes to get through the roundabout. Leave space for the truck. Get clear of a truck driver's blind spots as soon as you can. 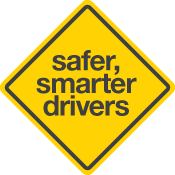 Move to a position well in front of or behind the truck, where the driver can see you. Source: Acceleration and deceleration testing of combination vehicles Report Number RUS-04-1075-01-05 (13 August 2004). WA Dept of Main Roads. So don't cut in front of a truck as it is slowing down to stop (for example at traffic lights) because you may not leave enough room for it to pull up. When driving on wet roads drivers should remember that a truck will take much longer to stop. Roundabouts can cause problems with car drivers not allowing for the need of the truck to possibly use the entire roadway. The 'DO NOT OVERTAKE TURNING VEHICLE' sign applies, so you should stay behind the truck as it may need to use all lanes when turning. 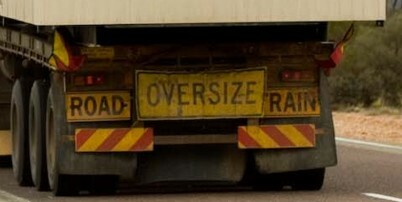 If a car or 4WD vehicle approaches you carrying the 'OVERSIZE LOAD AHEAD' sign be prepared to move over, slow down or stop to allow a truck loaded with a combination of a very long, high, wide or heavy load following close behind. The pilot vehicle escorting this over-size truck may even flag you down and warn you to pull off the road as the truck requires the whole road width.